On July 15 the Friends participated in New York State’s Invasive Species Awareness Week by hosting a workshop on Invasive Species at the Keeper’s House. Workshop leaders Diane Alden and Daria Gregg have participated in surveying the entire Westchester section of the Aqueduct trail, are Wildflower Guides at Teatown and have adopted sections of the Aqueduct near their homes where they have been working for many years to control invasive plants and to do restoration planting with native species. Diane is an amateur naturalist and Daria is a Citizen Scientist at the NY Botanical Garden. Diane started out the workshop with a statement about invasive species and about the use and meaning of the terminology used. She emphasized that all of us belong to one species: Homo sapiens. Some biologists are hesitant to use the terminology: “invasive species,” or “non-natives,” when referring to plants and animals, because of the political implications. But Diane stated that she could not find any way around using the terminology, as long as it is made clear that this does not apply to human beings. Why are we concerned about non-native plants? Our ecosystem is complicated; each part is intricately connected to the other; the soil, the fungi, the plants (flora), the fauna including insects, birds, mammals and all the rest have evolved together over the millennia and all are in a delicate balance. Each organism has natural enemies which keep it in check and also has mutualistic relationships with many other species. Severe problems occur when plants and animals which have not evolved together are introduced to the ecosystem; they often do not have any natural enemies to keep them in check, they do not provide ecosystem services to their fellow organisms and they overrun the environment, outcompeting and often destroying the native flora and fauna. Our insects depend on the native plants that support them – some can only survive when they have access to those plants with which they evolved – such as the monarch butterfly and milkweed. Our birds depend on specific insects and berries that provide the proper nutrition at just the right time to support egg growth, to support winter birds during the cold winter, and to support migrating birds with needed calories and fats. Some invasive species produce berries that the birds eat, but these berries provide the wrong nutrition at the wrong time; so the birds eat them because they taste good, but they are like junk food for them, bad for their health and using up digestive juices on the wrong food! They are high in sugar and become ripe just at the time when the birds need high fat berries. This is just one example of how invasive species harm their local environments. There are so many other negative effects. Here are just a few: besides crowding out the native species, some alter the pH of the soil, and some, such as garlic mustard exude a fungicide that destroys the beneficial mycorrhizal fungi upon which the plants and trees depend. The picture below shows the demonstration that had been prepared for the workshop participants. Labeled specimens of invasive species that had been found along the Aqueduct Trail in Dobbs Ferry were lined up along with charts showing some of their detailed characteristics. Diane and Daria took turns describing each one before taking the group on a scavenger hunt to find them and place temporary labels along the trail to help with the identification. 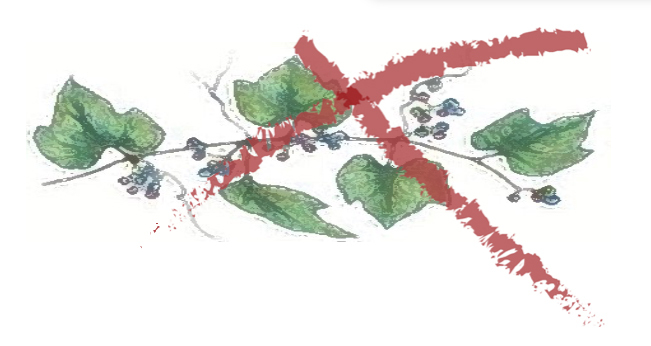 Diane demonstrated Porcelain berry vine which grows rampantly on the trail, covering trees, bushes and plants, eventually killing them. Daria demonstrated Japanese knotweed, which grows on the trail and along roadsides, crowding out everything else in its way. With this in mind, we wanted to point out some of the valuable native plants that can be found on the trail that are in need of protection. Here is Diane extolling the virtues of the native Spice Bush. With plant labels in hand, we began our hunt for the invasive plants along the trail and to work to learn how to identify them. Here are some members of the group, on our lovely trail with the river in the background, proud to have identified garlic mustard, the plant that exudes a fungicide, killing the beneficial mushrooms that support our trees. We labeled the plant and then retrieved the label on the trip back. One attendee, Steve, identified an Oriental Bittersweet vine, the berries not yet ripe. Later in the season they will open up to reveal the orange berry inside. But this one may not have a chance to ripen because Steve vowed to return to cut down the vine and save the bush along the trail. Steve correctly identified and labeled Japanese knotweed lining the trail. The now quite knowledgeable group returned from the walk, accompanied by Tim Lamorte, reporter from the local newspaper, the Enterprise, who attended the workshop and published two photographs about the event. Workshop participants were given handouts to assist with identification of invasive plants and were encouraged to continue to learn how to identify them, with the idea that they might work to minimize or eliminate them on their own properties, possibly join local groups – such as the Hastings Vine squad, adopt a section of the Aqueduct as an Aqueduct Steward and even start their own stewardship groups. Other opportunities include participating in the May 4 I Love My Park Day in 2019, contributing to the Friends of the Old Croton Aqueduct, which supports invasive management projects, etc. Daria provided a handout listing opportunities and resources. Here it is along with some useful website links. If you do your own yardwork: Start small. Identify the non-natives, then research if they are a problem. Slowly remove them, roots and all if possible. Replant the area with an appropriate native plant for your habitat. Disturb the soil as little as possible, because the soil is a seed reservoir for non-native plants. For those wanting to work elsewhere on the OCA, contact Haven as per above or Diane Alden daldenpc@bestweb.net for information.